The first Nicholas, Clemson-class Destroyer No. 311, was laid down 11 January 1919 at Bethlehem Shipbuilding, San Francisco. At her launch 1 May, she was sponsored by Mrs. Edith Barry. She commissioned at Mare Island Navy Yard 23 November 1920. Nicholas was held in “rotating reserve” until February 1923, when she was attached to Destroyer Squadron 11, which participated in the Navy’s first Fleet Problem off Panama. Thereafter she continued operating with the squadron along the West Coast. On the morning of 8 September 1923, with Nicholas under LCdr. Herbert O. Roesch, the squadron cleared San Francisco on a high-speed run to San Diego. 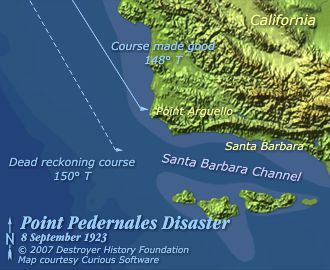 Fifth of fourteen destroyers in column that evening as the formation closed the entrance to the Santa Barbara Channel in a heavy following sea, Nicholas followed the ships ahead in a premature course change to port. Minutes later, after entering a fog bank that concealed the coast, flagship Delphy stranded at speed on rocky Point Pedernales (locally known as “Honda,” north of Point Arguello at today’s Vandenberg Air Force Base). She was followed in close order by S. P. Lee, Young, Woodbury, Nicholas, Fuller and Chauncey; three other ships touched bottom before backing clear. Above: Nicholas and S. P. Lee stranded at Honda. Click to view this image in more detail or more photos from the Naval History and Heritage Command. As “Fats” Roesch realized ships ahead “showed some confusion,” shearing out of line and stopping, he ordered a turn to port. Immediately and violently, however, Nicholas struck an unseen obstacle aft to starboard and could not extricate herself. Pivoting and flooding in the surf, she lurched shoreward until her stern came to rest less than 50 yards from S. P. Lee, which was lying broadside against a bluff. With their ship’s flooded hull careened 30° to starboard—precariously at first but stabilizing as the tide ebbed—the Nicholas crew clung to exposed topside handholds through the cold wet night. In the morning, after multiple attempts, the S. P. Lee crew succeeded in shooting a line upwind across the gap and then helped ferry them ashore in their “donut” life raft—a hazardous operation amid the oil-covered swells that swamped Nicholas’s stern and crested at the beach; it was extremely fortunate that none were lost. Over the next days, Nicholas’s bow broke off as wave action began destroying the stranded ships, all seven of which were stricken from the Navy List on 20 November. At a General Court Martial convened 1 November, LCdr. Roesch, alone among the individual ship commanders, was found guilty of negligence but the verdict against him was later set aside. A second Nicholas, Fletcher-class DD 449, commissioned in 1942. Sources: Naval History & Heritage Command selected naval documents and Dictionary of American Naval Fighting Ships, Lockwood, Tragedy at Honda and Point Honda Memorial.